Sharing the screen for the first time, Donald Sutherland and Kiefer Sutherland star in Emmy Award-winning Director Jon Cassar’s brooding western Forsaken. A story of an estranged father and son’s reunion, the mending of old wounds and searching for redemption whilst tensions run high in a community besieged by ruthless land-grabbers, the stellar lead cast is completed by Brian Cox, Michael Wincott and Demi Moore. 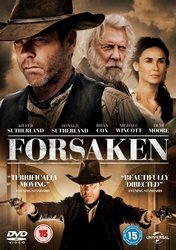 Forsaken is available on digital download now and Blu-ray™ and DVD from 11th July. For your chance to win one of 3 copies of Forsaken on DVD, all you need to do is answer the following question below. The competition closes at 23.59 (GMT) on Monday 18th July 2016.